genomeCoverageBed computes a histogram of feature coverage (e.g., aligned sequences) for a given genome. Optionally, by using the -d option, it will report the depth of coverage at each base on each chromosome in the genome file (-g). 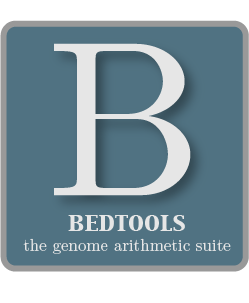 NOTE: genomeCoverageBed requires that the input BED file be sorted by chromosome. A simple sort -k1,1 will suffice. -d Report the depth at each genome position. Default behavior is to report a histogram. By default, genomeCoverageBed will compute a histogram of coverage for the genome file provided. The default output format is as follows: 1. chromosome (or entire genome) 2. depth of coverage from features in input file 3. number of bases on chromosome (or genome) with depth equal to column 2. 4. size of chromosome (or entire genome) in base pairs 5. fraction of bases on chromosome (or entire genome) with depth equal to column 2. Using the -max option, genomeCoverageBed will “lump” all positions in the genome having feature coverage greather than or equal to max into the max histogram bin. For example, if one sets -max equal to 50, the max depth reported in the output will be 50 and all positions with a depth >= 50 will be represented in bin 50. Using the -d option, genomeCoverageBed will compute the depth of feature coverage for each base on each chromosome in genome file provided. The “per-base” output format is as follows: 1. chromosome 2. chromosome position 3. depth (number) of features overlapping this chromosome position. As described in section 1.3.19, genomeCoverageBed will, by default, screen for overlaps against the entire span of a spliced/split BAM alignment or blocked BED12 feature. When dealing with RNA-seq reads, for example, one typically wants to only screen for overlaps for the portions of the reads that come from exons (and ignore the interstitial intron sequence). The -split command allows for such overlaps to be performed. For additional details, please visit the Usage From The Wild site and have a look at example 5, contributed by Assaf Gordon.